I know a lot of people hate licorice – or think they hate licorice. In the right contexts, I think pretty much anything can be tasty, and licorice is no exception. Brambles have a base scent that’s thick and rich and inky and tannic and, to me, the very smell of black. It’s also easily lost by over-processing or drowned out by more assertive aromas. A gentle application of licorice seems to highlight this illusive base scent. You might not even notice the licorice if you don’t know it’s there, though you would surely miss it in its absence. Approximately 1 cup brambles or wild blackberries. Combine the brambles, liqueur, and licorice extract, and set aside. Combine the cream, sugar, vanilla, and licorice root in a sauce pan. Heat until just boiling, then reduce to the barest of simmers. Allow to infuse for at least 10 minutes. In a separate bowl, beat the eggs together into one soupy mass. Fish the root and vanilla out of the cream. Whisk about half of the hot cream into the eggs, pouring slowly, in order to temper them. Then return the eggy cream to the rest in the saucepan. Gently heat the cream over medium heat, stirring with a silicon spatula or wooden spoon, until the mixture thickens slightly. It will cling to the stirring device slightly, and will have the consistency of melted ice cream (surprise!). Keep in mind that this point will occur at approximately 70°C to 75°C (about 160°F), so you shouldn’t even be in the same county as a boil. Or just use a thermometer and stop guessing. Strain the mixture into a bowl, and chill in the refrigerator overnight. Freeze in an ice cream machine. Add the reserved brambles during the final minutes of freezing. 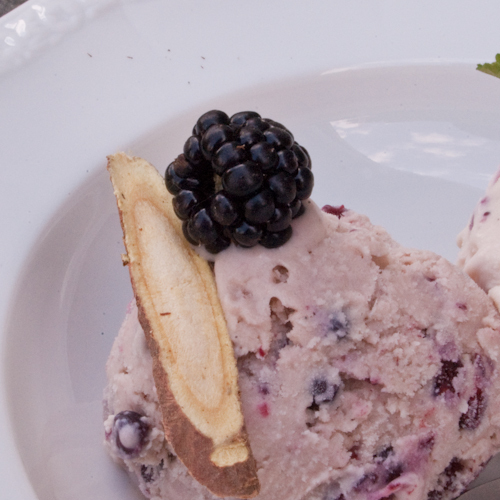 Bramble licorice frozen yogurt. The piece of wood is a dried licorice root. In the spring I purchased what was labelled as a rose-scented geranium (pelargonium) because I was keen to have the rose scent for baking. The variety, “England’s Rose”, didn’t have the pronounced rose scent I was looking for, but it smelled nice anyway – like the floral notes of very high quality black pepper without the bite. As the season wore on, a bit of rose scent did eventually appear. 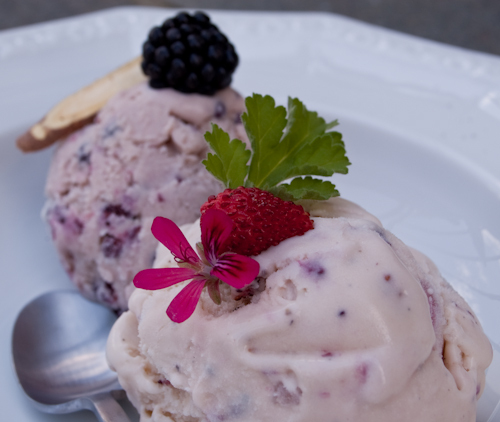 Brushing past this plant while carrying a bowl of wild strawberries inspired this flavor. If you don’t have a geranium, try black pepper and a few old-fashioned rose petals, or even some rose water. 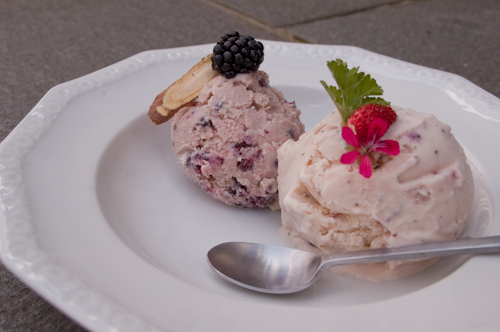 The flavor of the ice cream starts out with the rich floral berry tones of the strawberries, then after the cream warms on your tongue, the rose and pepper come out to play. 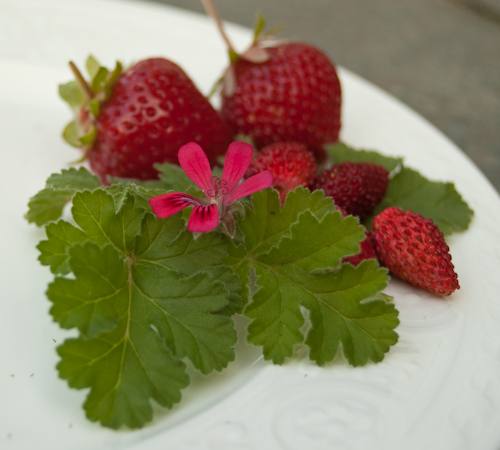 Rose-scented geranium leaves and a couple of fraises-des-bois. The garden strawberries are for comparison. Combine the cream, milk, sugar, geranium leaves, and vanilla. Infuse as in the previous recipe. Keep in mind that you’ll more likely smell the geranium on your tongue rather than smell it from the pot. Fish the leaves and vanilla out of the cream. Temper the eggs as in the previous recipe. Heat the eggy cream as above. Strain into a bowl. Add the fraises-des-bois and fresh pepper. Chill overnight. Great pictures. I have to find out where you can buy dried licorice root. Thanks! Asian stores seem to be a pretty reliable source for dried licorice. I had no idea geranium was edible– nor have I ever heard of dried licorice. But both of these ice creams sound (and look) quite tasty! I feel I should be super clear here, the non-citrus scented pelargoniums (“scented geraniums”) are edible, especially cultivars of pelargonium gravolens. The geraniums so beloved of windowboxes here in Germany are a completely different genus, and though they look awfully similar, are not edible. The licorice root is the natural source material for the flavoring people put in candies and drinks and things. People in China sometimes flavor broth using the dried root.